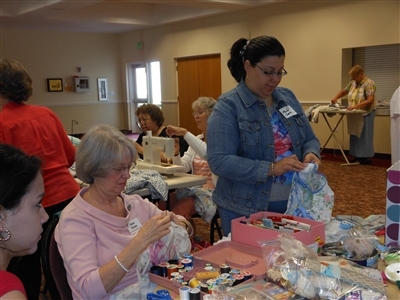 East Naples UMC hosted a sewing party for the "Dress a Girl Around the World" ministry. Photo from East Naples UMC. It’s hard to imagine that a simple pillowcase or T-shirt could impact children around the world, but thanks to sewing ministries at Florida United Methodist churches, it does. In March, the Florida Conference posted a story about East Naples UMC's “Dress a Girl Around the World” ministry on the conference Facebook page. The church hosted a sewing party that brought teenagers and "golden agers," winter visitors and volunteers from the East Naples' Hispanic ministry together for four hours to make dresses out of pillowcases for the Christian organization Hope 4 Kids International. The party yielded 30 dresses for the organization, which distributes them to impoverished girls around the world. Volunteers there planned to complete another 120 dresses for the cause. Several other churches responded to the post with stories of their own. At First UMC, Baldwin, the Tuesday Toilers are making their mark on the world by sewing dresses for girls, shorts for boys and backpacks out of child-friendly fabric. They started two years ago, making dresses for girls in Africa, and more recently took their latest designs to their sister church in San Antonio de los Banos, Cuba. “They were so grateful for everything, especially the backpacks,” said Jane Sheppard, 71. The sewing group is made up of about six regular women from First UMC and other local churches that just get together for the love of sewing and serving. "There are so many homeless children. ... The backpacks give them something that is their own." And that includes needs closer to home. Sheppard said the Toilers plan to send some dresses and shorts to a local homeless shelter. This past Christmas, they donated their colorful backpacks to a class of children with autism in the area. A grandmother in the class filled each backpack with toys and crayons. “Some of our ladies don’t even sew, but they iron or cut or just make lunch,” Sheppard explained. Nancy Vallario from First UMC, Williston, is part of a small but dedicated sewing group at her church that makes dresses out of pillowcases and boys' shorts out of gently used T-shirts. Since then, the group has made and sent 50 more dresses to Zambia and East Angola with a local missionary, and an additional 82 dresses as part of Samaritan’s Purse Operation Christmas Child program. “Some of us can’t go on mission trips because we are too old, so this is a way that we can help, with these gifts,” Vallario said. Pastor Will Clark, who pitched in and stitched a dress himself, has a different perspective. “It was hard. But Nancy mentored me through it,” said Clark, who plans on making more. The women plan to send more dresses and shorts with their church missions’ team to Nicaragua this September. They consider it an easy task when they have had such a generous outpouring of donations, both fabric and financial, from their church community. “When we first started, we put on a fashion show with the little children from our church modeling our clothes and we raised $5,000,” Vallario said. 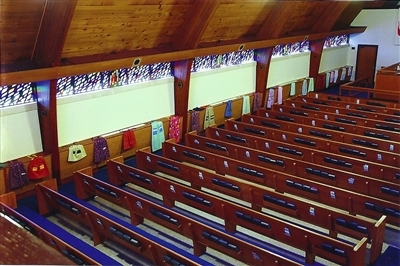 Garments made by Arlington UMC volunteers for children in Haiti and the Dominican Republic line the sanctuary walls of the church. Photo from Arlington UMC. What started as a project to honor the memory of a dear friend two years ago turned into an international operation at Arlington UMC, Jacksonville. Eleanor Kelly, 85, was asked to make and donate some dresses in memory of her friend, Pat Haney, who also loved to sew. She wasn’t sure where to get the fabric from, so she put a notice in the church bulletin and was surprised by the outpouring that came in. With the material donated, her team of seven was able to make 94 garments (dresses or pairs of shorts) for children in the Dominican Republic and another 90 that were sent to an orphanage in Haiti. The ministry has continued but shifted to making blankets for children that are distributed wherever the team sees a need. Dorothy Moore volunteers her time and talent to Jumpers for Joy, a ministry that benefits schoolchildren in need. Photo from Harris Chapel UMC. Featured last year on Florida Conference Connection was the Harris Chapel UMC sewing team, Jumpers for Joy. Juana Jordan, church pastor, said the ministry is still going strong, and she is thankful that the volunteers continue to bless kids in the surrounding community with new school uniforms. “There are a number of families here who can’t afford to purchase these clothes for their children,” Harris said. -- Tania Spencer is a freelance writer based in Sunrise.